/ Modified jan 31, 2019 12:43 p.m.
TUSD Superintendent Gabriel Trujillo addresses members of the media April 17, 2018, at the district administrative offices. The Tucson Unified School District will be holding a job fair on Saturday in an effort to fill more than 90 teacher vacancies in the 2019-20 school year, 25 of which are special education positions. 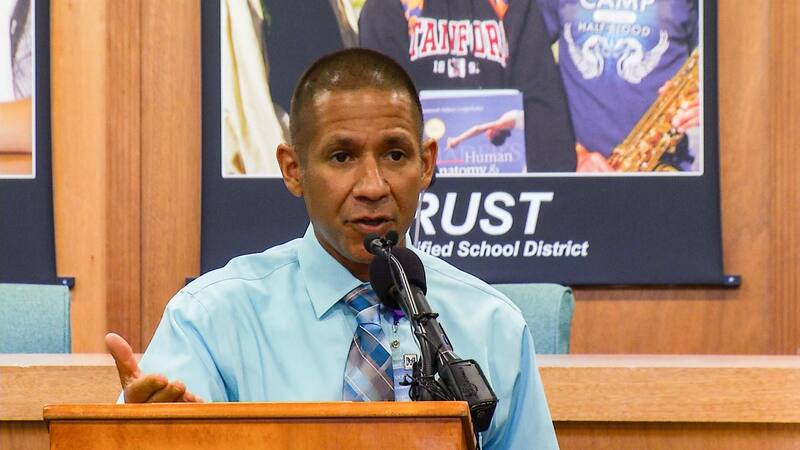 Superintendent Gabriel Trujillo on Tuesday said the district identified 91 teacher vacancies for the coming school year. TUSD's head of human resources, Janet Rico Uhrig, said she expects this number to grow in the next month as teachers receive their assignments for the fall. Uhrig said there will also be 47 support staff positions available. Trujillo said he considers these positions crucial for the success of the next school year. “Special education certified teachers are top of the list,” said Trujillo. He said TUSD also needs to hire four library assistants and two heating, ventilation and air conditioning technicians. Trujillo told AZPM earlier this month the district went from 80 open positions at the beginning of the 2018-19 school to 57 in January. Trujillo said TUSD decided to have its first job fair early in the calendar year in order to attract desirable applicants from fields with small pools of job seekers. Along with special education, TUSD wants to hire people who teach English as a second language, and more STEM-certified teachers. "You don't see a lot in those areas out there as you get deeper into March. This is why we want to strike very early with the job fair — the very first weekend in February. Then we want to strike again the very first weekend in March," said Trujillo. The district's first job fair will take place Saturday, Feb. 2, at Cholla High School from 9:30 a.m. to 1:30 p.m.